In some ways, this is the most difficult part of making a harp. Up until this point, whenever I want to putter around in the garage there would always be something for me to do on the harp. Now I have to wait between coats of polyurethane. The can of polyurethane says to wait four hours between coats, but that is NEVER enough. Not if you want a mirror smooth surface. 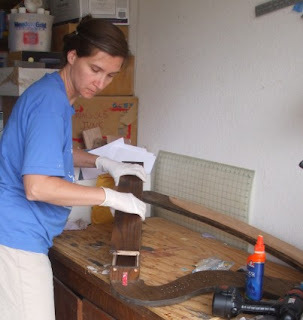 My woodworking consultant, Heidi, always waits several days between coats. I've compromised for my own method. I wait 24 hours after the first coat, 72 hours after the second coat, and then three weeks after the third coat before tuning up. Before each coat I sand the whole harp down with 220 grit sandpaper, then remove all dust and oil using a rag dampened with mineral spirits. Oil from my skin can affect the polyurethane, so it is important that once I start this process I never touch the harp without gloves on. 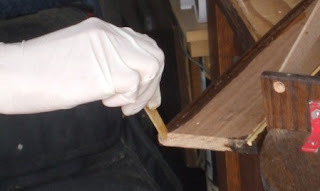 There are probably as many methods of applying polyurethane as there are woodworkers. This is the one I use: using a one-inch fine bristled paint brush and working one small area at a time, brush the polyurethane on against the grain, then smooth it in with the grain. That way I go over every area twice, ensure a thin coat, and catch any drips that might try to happen. And there you see the result. Just look at that baby shine! 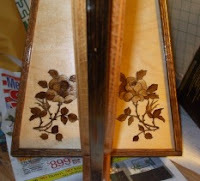 Once the polyurethane is dry, I can paint a design on the soundboard. First I do a line drawing with my drafting pen and waterproof ink. 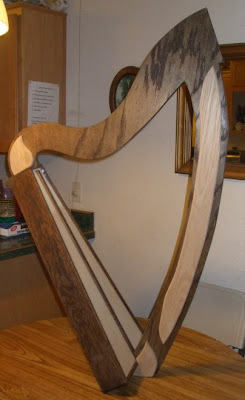 Then I paint using the same wood stain that I used on the body of the harp. 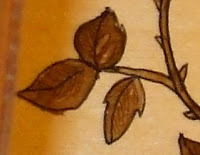 Wood stain is a difficult medium to work with. If you try to paint over an already painted area, the fresh wood stain dissolves the older wood stain and forces all the pigment to the edges of the wet area. So you paint the dark areas first, then lightly brush in the lighter areas around them, trying hard not to bleed the new paint into the old. Of course I do use this interesting property of wood stain to good effect. I can create light colored veins in leaves by painting on a partially dry dark leaf. Harrison Ford: the man who can make badly written dialog sound good. Good thing for Indiana Jones. Our story opens with Dr. Jones being fired from his university teaching job because he helped a beautiful but evil psychic communist Russian lady spy steal space-alien remains from a warehouse in Area 51. Of course he was forced to do so at gunpoint by a squad of Russian soldiers, but in the anti-communist climate of the 1950's, that still leaves him under suspicion. I mean, any true red-blooded American would rather be shot than let the Russians have our precious space-alien remains from area 51, right? As it happens, Dr. Jones is glad he doesn't have to teach classes for a while. Just as he's on his way to sulk in Europe he receives a mysterious coded letter from a former colleague who was hunting for a lost temple in South America. To further complicate the matter, the letter is delivered by a teenage boy on a motorbike, leather jacket and hairdo reminiscent of The Fonz, who claims his mother knows Indiana. And guess what, mom is being held captive by the Russians somewhere in the Amazon. Those Russians do get around. The film had some clever moments, but much of it was re-hash of old ideas. Especially amusing was the way everyone looked so amazed as they discovered that the space-aliens had taught farming and civilization to the Incas or Aztecs or whoever they were. I mean, haven't they seen 2001 A Space Odyssey? Oh, I guess not. That came out in 1968. I disliked the fact that so many people died horrible deaths in the film. It made it less fun for me to see extras lying all over the ground. Another problem I had was the teenage boy, played by Shia LeBeouf. They tried to make him a tough kid, but I'm afraid that no matter how many lousy action films they put him in he'll always be Stanley Yelnats for me. I was sorry they gave him a couple of vulgar exclamations. "So what does that make you? A triple agent?" Better than Temple of Doom, not as good as Last Crusade, still a worthy addition to the series. However, when the writers have to resort to space-aliens and psychic Russian lady spies, it is probably time for Indy to hang up his hat. At last the time had come. All the pieces were shaped, fitted, and stained. The harp was ready to be assembled! 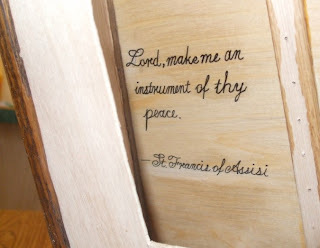 I always put this inscription on the back of the soundboard of my harps. 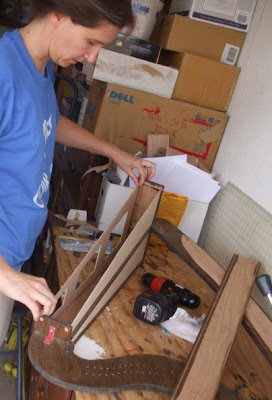 I had already attached the top and bottom of the box to the arch and pillar using wood screws and wood glue. Next I needed to install the wood screws to hold the box together, two on each corner. Because I was working so close to the edges of the boards it was very important to countersink the screws so the boards would not crack. 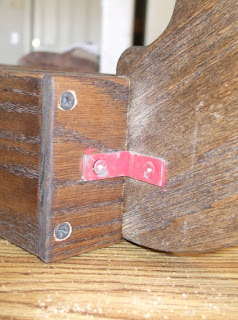 This red metal brace is to keep the top of the arch from twisting due to the torque from the strings. I'll cover it with a stained wood piece to make it look nice once everything else is assembled. Once the wood screws are all in place I take them out on one side so I can glue in the soundboard and the back of the box. I'm using 2 ton epoxy with a 30 minute working time for the soundboard. There is between 500 and 1000 pounds of pressure on the soundboard once all the strings are tuned up tight, so 2 ton epoxy ought to do the trick. 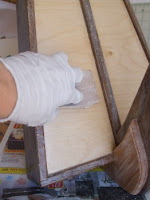 First I put wood glue in the grooves for the box back and slide it in place. Then I pull out the soundboard and spread the epoxy in those grooves before sliding it back into place. Last of all I prepare the remaining side of the box with a new batch of epoxy. After putting the side of the box on, I screw the wood screws in. All done! After the epoxy has cured I cover the metal brace at the top, then add the foot pieces at the bottom of the pillar. 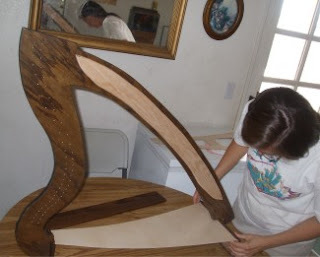 The foot pieces are important to help the harp stand upright and to keep the base of the pillar from twisting. I added a decorative wood piece on the arch at the top of the box, just because I felt like it. Those other pieces of light-colored wood are not just for decoration. The long ones keep the pillar from bending under the tension of the strings. Notice that the bottom of the string rib is braced by the inside edge of the pillar. This is to keep the strings from ripping the soundboard out of the base of the box. After staining the sides of the box and the pillar and arch I was ready to fit the soundboard. I cut it a little large so that I could sand it to a perfect match. Once the sides of the box fit snug with the soundboard in place, I disassembled the harp again so that I could put the string rib on. Many harps these days don't have a top string rib. The top string rib is to protect the soundboard from the strings. Metal grommets can serve the same purpose. 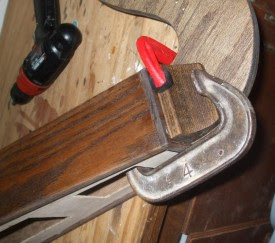 The bottom string rib is more important, giving a strong anchor for the strings. For me, the grommets are too much extra work, and I like the look of a top string rib much better. 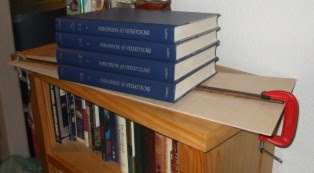 I thought those old encyclopedias would be good for something someday. Once the glue is dry, I can drill the holes for the strings. Then it will be time to assemble the harp! No author I know can top Brandon Mull for sheer imaginative power. Kendra and Seth Sorenson are the grandchildren of the caretakers of Fablehaven preserve, one of the few places left on earth where magical creatures can live on in an increasingly skeptical world. The trouble is, not all magical creatures are nice. In fact, some of them are downright evil. All the worst ones have been locked away in a magical prison, and if they ever get out, the world as we know it is basically over. Mull creates a world where the stakes are high, danger is real, and almost everyone is under suspicion. His book has an endless parade of fascinating magical creatures, each with their own habits and personality. Fablehaven 3 contains Mull's best paced plot so far, with lots of adventures, an intense action climax, and an ending that leaves the reader eager for the next book. Mull introduces some great new characters in this book, and only kills off about half of them. He's still having trouble with Grandma Sorensen, who had more personality during the time she had been turned into a chicken, but his tween-aged characters live and breathe as always. Seth is still my favorite, and I'm glad to see him begin to discover more of his abilities in this book. So go out and buy your own copy. You certainly can't borrow mine. My husband is going to start reading it to our children tonight, and we just can't wait! The film opens by taking advantage of all the natural drama of cut-throat politics. Young Prince Caspian has to flee for his life because his evil usurping uncle's wife has just given birth to a son and potential heir. Fortunately for Caspian, he has a secret passage at the back of his wardrobe, and thus avoids being made into a pincushion in his sleep. Caspian's kindly old tutor sends him into the woods, where he encounters the Narnians: talking animals and assorted creatures from Greek Mythology who have been in hiding since Caspian's ancestors took over. Meanwhile, Peter, Susan, Edmund, and Lucy have been through a miserable year of trying to adjust to life in dreary old 1940's England after having been kings and queens of Narnia. Just as they're about to take the train to boarding school, the train station blows away and leaves them standing on a beach. Can you get any more wishful thinking than that? The kids immediately guess they're back in Narnia, I mean, where else could they be? What they don't know is that it has been over 1000 years since their last visit, and this time they have to help Caspian reclaim his rightful throne. The first half of the film enchanted me. Everything worked, even Edmund's electric torch. Storming the evil uncle's castle was an unexpected twist that had not been in the book, and it turned out to be one of my favorite sequences of the film. The spell remained unbroken until at one point King Peter and Prince Caspian start blaming each other and arguing in front of everyone like a couple of idiot teenage boys. I know they are teenage boys, but Peter has been a king and Caspian has been trained to be one, and rule numero uno is: never argue in front of the troops! It was so-o-o-o unprofessional. After that point, the film got a little silly. Sure, the epic battle scenes were great to watch, but if Aslan could have shown up and saved the day sooner, why didn't he? They tossed out a few excuses as to why he waited until the last minute, but I was not convinced. Still, I couldn't help feeling an ache of loss when Peter, Susan, Edmund, and Lucy end up back at the dreary old train station again. Everything in Narnia is beautiful, the landscape, the architecture, the CG creatures, the costuming, and even Caspian's embroidered pajamas, which I think he wore for most of the film. No time to pack when you're running for your life, I guess. Lots of people die violent deaths in this film. I agree with those who said it should have had a PG-13 rating. I don't know if that would have stopped anyone from taking their little kids to it without seeing it themselves, but it might have made the director take the film back and cut out some of the more disturbing footage to earn it a well deserved PG. Last Monday I took my almost-three-year-old to the optometrist. About six months ago I began to see him go cross-eyed. Over time it became more obvious until three months ago I took him to the pediatrician. Due to the complexities of modern health care, the pediatrician had to refer me to an optometrist, who then had to refer me to a pediatric optometrist. After two weeks of calling to make sure all the referrals were properly faxed, I finally learned that the only pediatric optometrist on my HMO is semi-retired and comes to her office on my side of town only on Mondays. The first time she could see my son was eight weeks away. Now, eight weeks later, in the exam room at last, I sat with my son in my lap while the optometrist ran through a battery of tests. She used prisms to check how much his eyes were crossed, and then had me cover each of his eyes in turn while she tried to get him to track a stuffed toy across his field of view. All the while she kept saying, "Oh yes," in a very serious tone of voice. That made me nervous. Oh yes what? Oh yes, this kid is really messed up? "So that left eye can turn out, it just doesn't want to," she cooed at my child after she had finished her last test. "He's a little cross-eyed," she told me. "Well, I'm glad I'm not going crazy. When I first noticed, I started asking all my friends, 'Does he look cross-eyed to you?'" It was true. He crossed his eyes so slightly at first that I wondered if I was imagining it. They put some eye drops in his eyes and told me to go out and wait in the lobby while his pupils dialated. We had been at the office for almost two hours already, and the child was not about to sit still. I tried to keep him from terrorizing the tropical fish and running out the front door. When I thought I could not take it any longer, they called us back for the last test. "Oh yes," the doctor said again as she shone her light though a lens and looked in my child's freakily dialated eyes. "He's far-sighted. He needs glasses." She rattled off the prescription to the nurse. Then she explained, "There's an equation in the brain stem that relates focusing to eye alignment," she told me, "If we can correct the focusing, the alignment should go back to normal. Hopefully, with glasses, he'll grow out of it before he's twelve. There's an eighty percent chance the glasses will do the trick." "Thanks," I said, wondering how I was going to get a two year old to wear glasses. The doctor did not offer any suggestions. I know I should have asked, but I got busy chatting with her about her life and her career and why it is that blue eyes look blue--I've always wondered that. When I got to the eye glass shop I wished I'd asked. Trying out frames was a disaster. My son would hardly leave them on long enough for me to see how he looked. Finally he tore one pair off and flung it across the room, sending it clattering under the service counter. We were done. "I don't know how I'm going to keep them on him," I told the woman who was helping me. "Most kids keep them on once they get their real lenses in. They like being able to see," she assured me. I was skeptical about this until we went to pick up the glasses. When my son got to try them on his eyes grew big and round with astonishment. He glanced around the room, startled and surprised. A little bubble of joy welled up inside of me. My child could see! I never knew that he couldn't, but now he was seeing the things that were close to him clearly for the very first time in his life. For the first three hours, he kept the glasses on. I thought my worries that he wouldn't wear them had been completely unfounded. Then he came up to me while I was typing at the computer and handed me his glasses. "Mommy, I'm done with glasses," he declared with decisive finality. I guess he decided that being able to see up close without crossing his eyes was not worth having those things on his face. A few minutes later, I gently hooked the glasses back on over his ears. He wore them for a while, and then, "Mommy, I'm done with glasses." I thanked him and set them aside, waited a few minutes, then said, "Time for glasses," and put them back on. He accepted this, wore them for a while, and then brought them to me once again, "Mommy, I'm done with glasses." I know that in a year or so I'll be able to reason with him, but for now I'll just be grateful he hands them to me instead of flinging them across the room. "Do you want a ride?" my friend asked. "Of course! Why do you think I'm hanging here in your window?" I'd obstructed the flow of traffic to walk out in the street and chat with one of the other moms who was there to drop children off at school. She shook her head and made a grand gesture with her hand, her hand that was in a brace due to her recent flare-up of carpal tunnel syndrome. "You need no excuse to hang in my window." I laughed and bounced into the passenger-side seat of her mini-van. "My husband is done with school for the semester," I announced happily, "So I'm sending him off to get the oil changed today, and the roofers are here!" I recalled that last fact with great satisfaction. "I remember right after we first bought the house I was so angry when I realized we needed a new roof. I thought we'd never save up enough money to do it, but now here we are, four years later." "You are amazing," my friend said. "That you pay cash for things!" "I would never finance a new roof," I said, surprised that this was so amazing. "Not unless it was an emergency, the water pouring in . . ." I used my fingers to illustrate water dripping, then dropped my hands in my lap, "Actually, the water was pouring in. I just bought a can of roof patch, fifteen dollars at Lowe's, and went up there and slopped it on." That had held it for four years. What amazes me is that anyone would find this amazing. I'm a Mormon with a minor in mathematics. I don't drink, smoke, gamble, or borrow money---except for our home mortgage. Not that borrowing money is always evil, but if I had car payments and credit card payments, how would I feed my five children? I finished all the routing on the harp today. Last time it seemed the routing was the most horrible, time-consuming part of the whole process. When I started it last week it looked like I had remembered correctly. Frustrated, I took a closer look at my router bit. Blackened and dull, it wouldn't even scratch my finger. So why was I expecting it to cut oak boards? When I went down to Lowe's they didn't have 1/8" routing bits for the Dremel, so I ordered two new ones off of Amazon.com instead. It is scary what you can buy through Amazon! They came in the mail a couple of days ago, and I finally got around to trying them this afternoon. I could not believe the difference it made to have a sharp bit. The whole project was finished in two hours. This morning my just-turned-2-year-old approached me and in his baby language informed me that he had seen something “cary” (scary). He led me by the finger back to his room and pointed at a few toy cars on the floor. I didn’t see much that was scary about the cars, but somehow through his gesturing and limited vocabulary, I presumed he had seen a little bug of some sort. “Was it a scary bug?” “Bug,” he stared repeating, putting a scooped hand along the ground like Audrey sometimes did with the ants she would find and decide to keep as pets. Well, it must have been an ant or a spider, and I returned to my work, lamenting the beginning of warmer weather and the threat of ants finding the 20-pound bag of sugar I have kept open in the pantry all winter. Later this morning, I was standing at the doorway of the boy’s room casually chatting with my husband as he played with the boys when I felt something tickle its way across my foot. I looked down to see a very hairy insect slithering (thankfully) away from me. Big strong daddy jumped into action and told me to get the vacuum. While we disputed about the finality or lack thereof of sending the creature on a terrifying 3-foot journey down a hose into the suction chamber of the Hoover, the little beast crawled under the kid’s dresser, laughing glibly as it went. While my husband put on a pair of shoes and began pulling out drawers, I decided I wanted to know with what we were dealing. 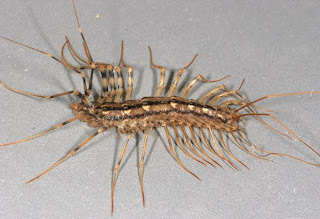 The common house centipede. I found that disturbing on three levels, all spelled out in the name. (The scientific website I visited to read more about it even scientifically confirmed the things were disturbing with these words: “They are highly predaceous arthropods, nocturnal in activity and disturbing when found indoors”). First and foremost, the word “common.” “Oh, yeah, those guys,” I can hear my seasoned neighbor say, “They’re all over the place. Welcome to New Jersey.” “House” obviously worries me because it indicates this little guy lives by “Mi casa, su casa.” And lastly is the very fact that this guy is a centipede, which as I recall from my science classes years ago likes to take a nip at people now and then. Thankfully this particular species is not very toxic, but he does have a “painful bite.” I’m glad he wasn’t on any rampage when he decided to traffic the territory of my foot. After tearing the dresser apart and searching the length of the wall behind piles of stuffed animals and toy bins, we were about to give up when we spotted him again. Dallyn had pulled back the toy bin one more time and was trying to show me a little hole in the wall where the thing might have crawled out, when it came casually pit-pattering back into view. Maybe he was trying to make a last mad dash for that hole. We gave him the boot (literally) and were safe once again. You can click on that image to get a better look. Beautiful, isn't it? I daydream while I'm doing my housework. Housework takes very little mental effort, so I give it none at all. For example, this morning I put the clean laundry from the dryer into the basket, put the wet laundry from the washer into the dryer, put more soap into the washer and started filling it with water, and then without thinking I emptied clean laundry basket RIGHT BACK INTO THE WASHING MACHINE! By the time I realized what I had done, the clean laundry was already wet and soapy, so I just let it run through another wash cycle. A minute ago I went to move the laundry again. The dry, clean laundry went into the empty basket, the wet laundry went into the drier, I added soap and started the water, looked down at my feet and saw a basket full of laundry and started putting it into the washer. About half way through the basket I realized I HAD DONE IT AGAIN! I was putting freshly cleaned clothes RIGHT BACK IN THE WASHER! I picked up the half full basket of clean laundry, hurried to the doorway, and deposited it out in the hall where it would be safe. Then I went and found some real dirty laundry to fill up the rest of the load.